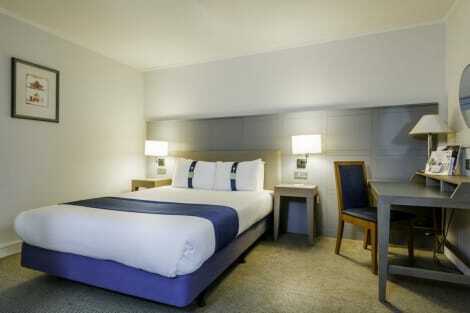 The Novotel Milton Keynes hotel is a modern 3-star hotel situated just outside the city centre. Check in and relax at family-friendly setting in a quiet location on the edge of Stanton Wood, which is just a four-minute drive from town. Conveniently located, the hotel is a couple of minutes from central Milton Keynes, and the Silverstone race track is a 25 minute drive away. There is also good access to the M1, and Milton Keynes Central train station is 4 km away. The Mercure Milton Keynes hotel is the perfect place to enjoy a tranquil escape away from the hustle and bustle of the city. Located next to the Abbey Hill Golf Club, this stunning hotel provides the perfect setting for weddings, meetings and events. With 91 newly refurbished bedrooms with a modern and contemporary design throughout, it's the ideal setting for families and couples alike. Whether your reason for visiting is business or leisure, you're sure to have a memorable stay. Located in the scenic village of Woughton-on-The-Green, the MGallery Woughton House hotel is a beautiful country house surrounded by green fields and parkland. This Milton Keynes hotel has 51 modern guest rooms and an award winning restaurant serving fresh, seasonal meals. The cosy bar serves light meals and traditional afternoon teas. With 3 meeting rooms on 100 acres of parkland, the hotel is ideal for business meetings, social events and weddings. Our Milton Keynes at The Hub hotel is located in the heart of Milton Keynes, in the city's vibrant business and retail district known as “The Hub”, where you will find a wide variety of restaurants and bars on your doorstep. Perfect for a business stopover or a leisure break, the immediate area offers several shopping and entertainment choices including Thecentre:mk and Intu shopping centres - both within easy walking distance from the hotel. You're also well connected with good transport links - Central Milton Keynes train station is less than half a mile away, and the hotel is less than four miles from the M1 and Milton Keynes Coachway. This new hotel features our upgraded rooms each with a comfy king size bed complete with four plump pillows and a cosy duvet. Our on-site restaurant and bar serves breakfast and tasty evening meals. 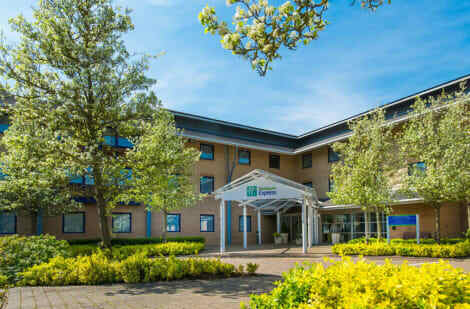 A welcoming Milton Keynes hotel near town centre, with Next Generation guest rooms and free WiFiHoliday Inn Express® Milton Keynes hotel is located near Junction 14, off the M1 motorway.Just 3 miles away, Milton Keynes town centre offers a host of restaurants and shops. With connections to Heathrow (LHR) and Gatwick (LGW) airports, Milton Keynes Coachway is 6 minutes away by car, while Luton Airport (LTN) is a 30-minute drive. On holiday with kids? They'll have a wild time on the rides at Gulliver's Land Theme Park, close by, or going for a spin around the rink at Planet Ice. The Xscape entertainment complex has a cinema, indoor skydiving and snowboarding. Check out the latest fashions at intu Milton Keynes shopping centre or see a show at Milton Keynes Theatre. Business guests can host a meeting for up to 66 people in one of our 8 naturally lit event rooms.At this hotel you can enjoy:- Express Start™ Breakfast included in the room rate- Free parking- Blackout curtains and bedside USBsEnjoy lunch or dinner in the Great Room restaurant or grab a pint from the bar, open around the clock. Feeling peckish? Order from our pizza menu at any time. After a busy day, retreat to your inviting guest room, complete with comfortable bedding, a pillow menu and TVs with Freeview. Family rooms come with a handy pull-out sofa bed that is ideal for the kids. Whether visiting the town itself or attending various events and attractions in the area, the Milton Keynes Central Hotel is conveniently located for an enjoyable stay. Just a twenty minute walk from the centre of town and only a quarter of a mile from Milton Keynes train station, it is in an ideal location for those visiting Xscape/Theatre District (0.75 miles), Gulliver's Land (3 miles) or Milton Keynes Bowl (1 mile). Guests can also take a trip to AirKik Indoor Skydiving for a unique experience, whilst Willen Lake and Woburn Safari, Woburn House and Woburn Golf Course offer more relaxing days out. All rooms feature a comfy king size bed with four plump pillows and a cosy duvet. Guests can enjoy a wide variety of food and drink choices within a short distance of the hotel. Useful information.Due to city centre location of this hotel some external noise may be heard. 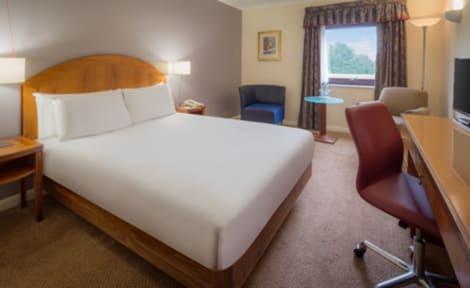 Located 30 minutes from Luton Airport and close to junctions 13 and 14 of the M1, the Hilton Milton Keynes hotel in the UK is in an ideal location just 4 miles from the center of Milton Keynes. Visit a host of local attractions, including Whipsnade Zoo and Bletchley Park. The guest rooms are all bright and attractively decorated and fully connected with WiFi and 32-inch TVs. Upgrade to a suite for a larger living space, with separate seating area and easy chair.Hold a conference, wedding or other large event in the 2,970 sq. ft. Cranfield Suite, which seats 300 guests in an elegant setting. Hold meetings in this Milton Keynes hotel's 14 meeting rooms, suitable for 2 to 300 people. 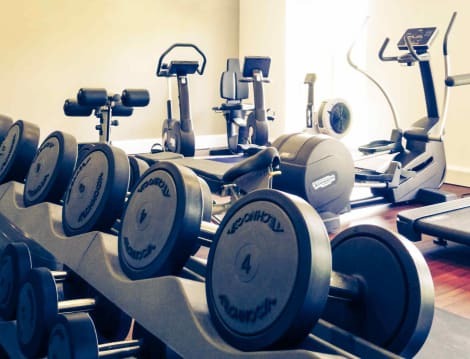 Keep fit with the cardiovascular equipment and weights at the hotel's Fitness Room. One of the most unique hotels in Milton Keynes, the contemporary Doubletree by Hilton Milton Keynes hotel offers luxury accommodation integrated into the west stand of the new 22,000 seat stadiummk. Only a few minutes from Milton Keynes city center, the hotel is just 45 minutes north of London by train. This Milton Keynes hotel is the ideal venue for your wedding party or conference, with 27 meeting spaces and the largest ballroom in the area. The Doubletree by Hilton Milton Keynes hotel features modern, stylish Guest Rooms, Suites and several pitch-facing rooms which can also be used as executive hospitality suites, with direct access from balconies to pitch facing seating. All rooms include LCD TVs and luxurious Sweet Dreams® bedding. Start the day with a Doubletree Breakfast, dine in our stylish and contemporary 'pitchside restaurant & bar', which benefits from fantastic pitchside views and watch sports in the chic 'red dot bar'. Visit Milton Keynes attractions like Woburn Abbey, shop at centre:MK and enjoy the nightlife at Xscape complex. We look forward to welcoming you with our signature warm Doubletree chocolate chip cookie at check-in. A central Milton Keynes hotel with a restaurant, conference facilities and an indoor poolHoliday Inn® Milton Keynes - CentralOpen Now - A spectacular refurbishment of our lobby, public areas and introduction of Marco’s New York Italian restaurant, providing you with a welcoming space to eat, drink, work, relax or socialise.In the heart of the town's business and shopping district, we’re a short walk from Milton Keynes Central station, served by direct trains to London. London Luton Airport (LTN) is a 30-minute drive away. Business guests are near companies such as Argos and Santander and can host up to 100 delegates in 9 flexible rooms at our Academy conference centre. Families enjoy exploring the former British WWII codebreaking centre at Bletchley Park, a 10-minute drive away. There are high-street shops at nearby intu Milton Keynes mall, and you can try your hand at skiing at the indoor Snozone.At this hotel you can enjoy:- Free WiFi- 24-hour room service- Kids stay and eat freeOnsite parking for a small daily feeComfortable rooms have Smart TVs, power showers and a choice of pillows to help you sleep. For extra space, book a suite with a separate living room. At the health club, swim laps in the indoor pool, work out in the gym or indulge in a rejuvenating beauty treatment. With a stay at Campanile Hotel- Milton Keynes in Milton Keynes, you'll be within a 10-minute drive of Bletchley Park and Xscape. This hotel is 4.3 mi (6.9 km) from Central Milton Keynes Shopping Centre and 4.8 mi (7.8 km) from Milton Keynes Theatre. De Vere Horwood Estate is a beautiful property 15 minutes from central Milton Keynes and the M1/M40 motorways set it 38 acres of stunning grounds. The hotel offers leisure facilities including indoor pool, gym, sauna, jacuzzi and outdoor tennis courts. 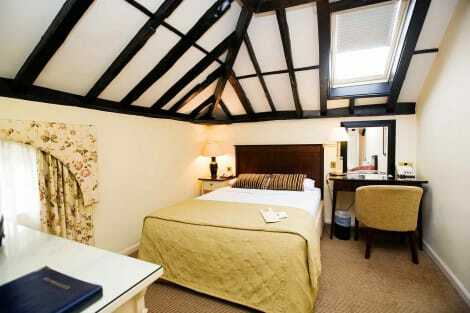 All of the bedrooms have been carefully designed and decorated ensuring a comfortable nights sleep. Take in the views from a garden and make use of amenities such as complimentary wireless Internet access and wedding services. Additional amenities at this hotel include tour/ticket assistance, a picnic area, and a banquet hall. Located in Milton Keynes, The Old Stables is within a 15-minute drive of Woburn Safari Park and Bletchley Park. This 4-star guesthouse is 6 mi (9.6 km) from Gullivers Land and 6.8 mi (10.9 km) from Xscape. Milton Keynes may have only been founded in the 1960s but it's already developed into an interesting holiday destination. 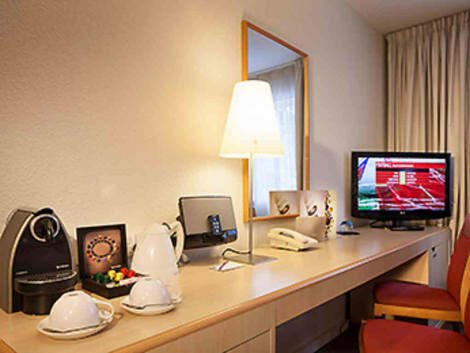 Milton Keynes hotels are numerous and varied meaning they offer a variety of options to suit your taste and budget. Milton Keynes has its own vibrant arts and culture scene for you to enjoy. Milton Keynes Theatre is really worth a visit with it showcasing many productions straight from the West End in London. You'll also not want to miss Milton Keynes Gallery which holds exhibitions containing lots of thought provoking contemporary art and best of all it's completely free. In addition to the exhibitions housed in the gallery itself the gallery also organises outdoor exhibitions around the city. Milton Keynes is home to a unique museum of World War Two history that can't be found anywhere else. Bletchley Park, now a heritage site, was the home of the British codebreakers charged with aiding the war effort by cracking German codes. You can adventure around the park with a multimedia tour and take a look at original enigma machines used in the calculations of code breaking. Bletchley Park also holds the National Museum of Computing and contains the largest collection of working historical computers in the world. A holiday wouldn't be complete without a bit of shopping and Milton Keynes has a great range of shops from large shopping complexes to boutique stores and farmers markets. The Centre Milton Keynes is a very large modern shopping centre with over 240 stores as well as lots of places to eat. The Centre also has its own open-air market located near one of its main entrances. If you're a keen skier then you will probably be surprised to find Milton Keynes has you covered at the Xscape Centre. Whatever the weather the Xscape Snozone indoor slope will be blanketed in real snow. The 170m slope has its own ski lifts and is suiSEOSITE_LEVEL_DESCRIPTION for all levels of experience with lessons and coaching available for all ages. The centre also offers climbing with coaching available and there are plenty of restaurants to refuel in after all the fun. There is a wide choice of restaurants in Milton Keynes with everything from the traditional pub to Indian and even Thai. One of the best restaurants is Paris House which is located in Woburn Park just 15 minutes from Milton Keynes. The restaurant holds a Michelin Star and offers an amazing ten course tasting menu which features classic recipes with a modern twist.